The Mumbai Mirror reads “FB’s confession pages become a headache for colleges and cops”. According to the Report published today i.e. 31st March 2013, several college authorities have lodged complaints to trace the author of anonymous posts who have been posting obscene remarks against female students, against the teachers and the administration. Confession pages are the new trend on facebook. 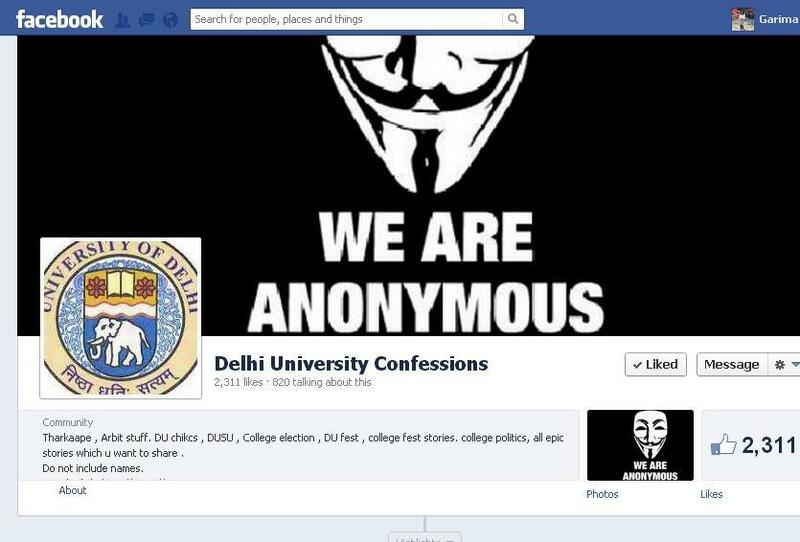 There are confession pages for schools, colleges, offices and even for Delhi metro. I am not sure if there is one for DTC buses. They are a huge hit. On Delhi Metro Confession page, one of the post read that the confessor is more attentive in metro now so that he/she can get something to post as a confession! A careful look at the content of these pages would tell you that they are actually a repository. Ofcourse, many confession pages are also working like the pigeon transport system to deliver love messages, but confession pages are also full of reflections, suggestions and most importantly, frustrations. I have seen confessions by victims of sexual harassment. The confession pages of schools and colleges can also give a peek view into their environment.The confessions on the pages tell you what the students are thinking about. In the LSR confession page, most confessions are a debate on feminism. I feel that in many ways, these pages are also contributing to the environment of the college. As a personal example, the confessions posted on the page are discussed on the page as well as in the college. But i propose to give a serious look at the critical comments. According to the report, there is a serious attempt to control this important aspect of the page. While obscene remarks should come under the radar, I cannot make up my mind if the latter deserves censorship. As I said earlier, confession pages are also becoming another source to vent out frustrations. I have read many confessions against the administration or about how things work in the college. To me, these should be seen as a feedback form. One of the confessions that i read was against a teacher. Somebody had commented that the page should not support anti-administration or anti-faculty posts. This person had also said that the confessor should have the guts to go and tell the problem directly, to which somebody commented that it is not possible for a student to go and tell the teacher directly. This is really a fact. Not only do many universities despise self-criticism, it is even worse in the case of a teacher. Not many teachers can take self-criticism, something that is unhealthy. In such a scenario, these confessions should be taken as a feedback and not as an offence. If a University bans a confession page, I feel that it is banning these voices and any university which is not self-critical cannot ever be successful. There is, ofcourse, another side to it. The question comes, “what if the person is trying to defame the university or a particular teacher?” I have a solution to check this. If there is a wrong post, people usually react to it and point it out. But in cases when it is true, it does not meet with any opposition. So if these posts are true and there is really a problem with a teacher or the way university is working, instead of finding out the confessor, the university should look into the matter. Though I myself do not appreciate anonymity to a great extent but in cases where we are dealing with careers, we must understand the importance of anonymity. Banning these pages will not solve any solution. It will be even more unhealthy. Ideally speaking, the administration should not try to intervene in this as this is off the campus but if it has to, I think that the Universities should take these pages seriously and treat them as feedback forms. This entry was posted in aam insaan, Democracy, Human Rights, Society.